I liked reading the Roy Thomas Fantastic Four issues around the time of the two Things storyline. The deja vu quality of the simulated Kirby artwork in some of those stories was almost disorienting and added to the weirdness. I do miss the freewheeling spontaneity found in mid seventies Marvels. 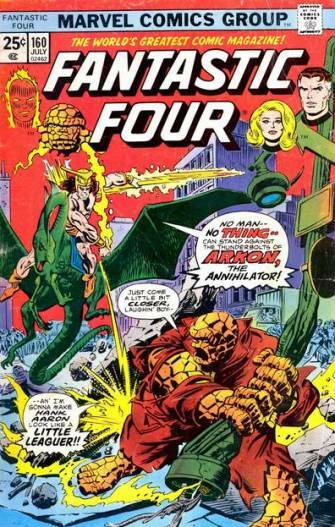 The casual looniness of a Fantastic Four cover with the Thing wearing a torn up suit, swinging a lamppost like a baseball bat and referencing Hank Aaron, seems unlikely to be replicated anytime soon.